I find Pinot Noir to be one of the more interesting wine varietals. I think it's because of the huge variance it can have in tastes, much more so than many other wine types. I'm not saying that's a good or bad thing, it just is what it is. I've heard this is because it's a difficult grape to work with. Now if you've looked through my wine reviews, you've no doubt noticed that I have reviewed several Layer Cake wines... and have yet to be disappointed in a single one. That's a mighty feat if I do say so myself. So, when I received a bottle of Layer Cake's Pinot Noir, my hopes were high! This wine is out of the Central Coast of California, or more particularly Monterey vineyards at Arroyo Loma and Alta Loma, as well as Santa Barbara vineyards near Los Alamos. This gives the wine classic Californian Pinot Noir traits. 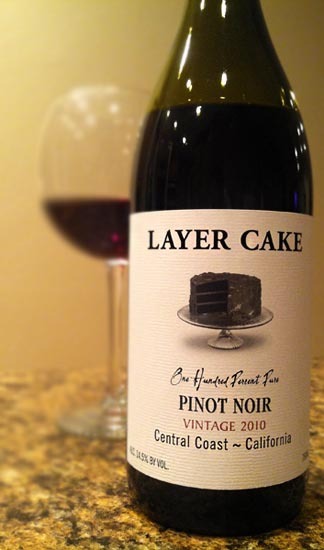 The 2010 Layer Cake Pinot Noir pours a gorgeous, shining dark ruby red. It smells predominantly of cherries with bits of red raspberry, vanilla, and a whisper of florals. Tasting brings a classy, silky mouthfeel with chocolate covered cherries, plum jam, dried cranberries, hints of tobacco, followed by mild vanilla and wood with gentle tannins. This wine was surprisingly restrained for a Layer Cake. Rather than being big and bold like their delicious Malbec and Zinfandel, their Pinot Noir took on a more classy, refined approach. Like I said, this Layer Cake Pinot Noir has a nice silky mouthfeel, is easy-drinking, and is dare I say... yummy. Go check out Layer Cake's Facebook page, yes click that link. Tell 'em Bob sent ya! Then go try this wine. Drink This: if you want another Layer Cake winner, albeit a bit more restrained. Don't Drink This: if you don't like yummy wine.